While I have been indoors AWOLvg (Absent WithOut Leaving) reading Turn Right at Machu Picchu by Mark Adams, Bruce the Weatherman has been trekking across the frozen Bay in his snowshoes in order to bring you this report. Bruce is even more intrepid than Mark Adams. Important safety warning: Bruce trekked out there on Tuesday morning. It is now Thursday afternoon and much, much warmer. Not that it will stay warmer, mind you, but it’s warmer now, and if you took it into your head to go a-trekking, you might just find yourself taking a very cold bath, followed by an icy interment. Sometime during the summer we would all kayak out there and drop lovely floral tributes. 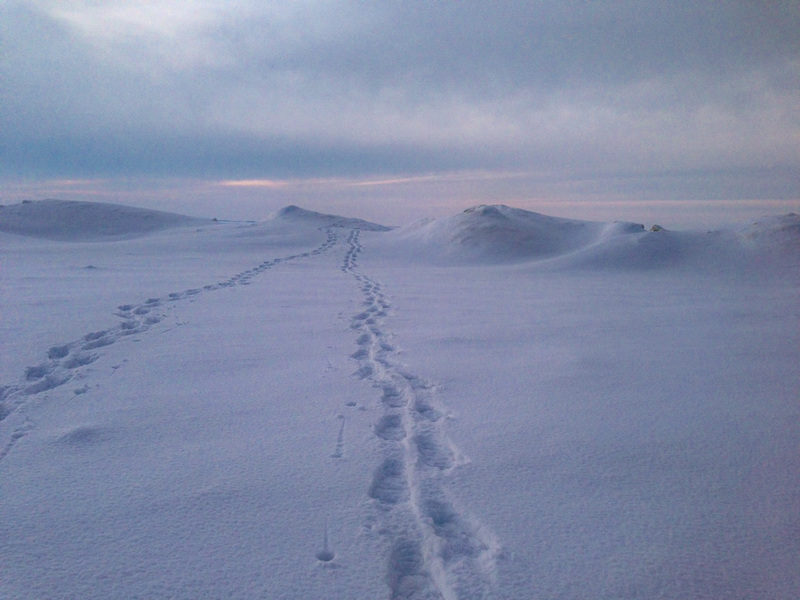 Bruce writes: That six foot high snowdrift on our beach has been a challenge and today I attacked with my snowshoes. 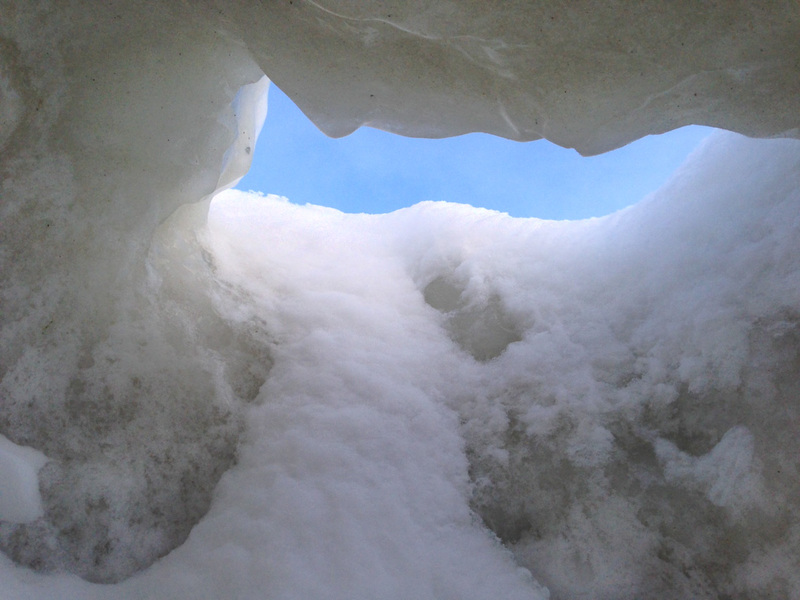 The snowshoes took me over the deep drifts and out into the land of ice bergs and snow caves. This ice cave had its own chimney. There are lots of other pictures on the internet of many cars parked on the roads leading to the ice caves on Lake Superior and the ice caves on Lake Michigan along the Leelanau Peninsula. Things are a little quieter Around Here, but these are our very own Antrim County ice caves and we have a proprietary interest in them. Your cave is very impressive. Thank you. It isn’t a patch on the ones on the Leelanau or up on the Lake Superior shore, but it is rather nice, and it has the advantage of being uncrowded. Beautiful scenes. I first read about this in The Guardian! It would have been fantastic to explore the caves. Well, you might have an opportunity yet, Martha. The last couple of days have been deceptive–and the wind’s up. I thought you’d like that. However, in your case I’m sure Trey and Miss Sadie could unite to rescue you while the Cowboy ran for reinforcements. 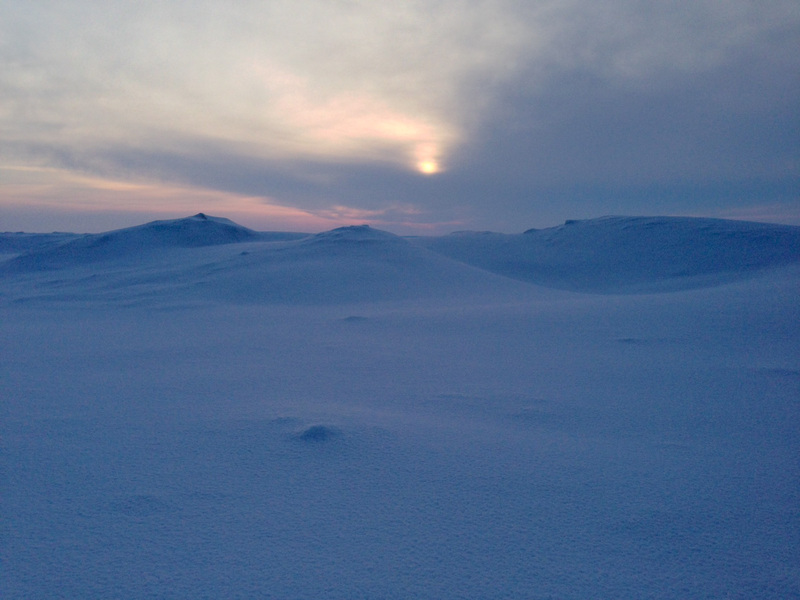 The photographs do a great job of showing how the play of light tints the snow blue, particularly near dusk. Sorry. Traipsing about on snow shoes is too intrepid for yrs trly. I would follow your wise example and stay indoors, guarding the supply of hot tea, coffee, soup, chocolate, and all those other essential hot nutrients. Oh, I traipse about on snowshoes occasionally. I have my moments. But then I traipse back to the Writing Studio and Bait Shop for sustenance. I love snow’s blue shadows, and the way it gathers evening into itself. Light has quite a playground here this winter. Remember the song about the wind in “Paint Your Wagon”? “They Call the Wind Maria,” yes, that’s the wind that blew through the Ozarks today. The Weatherman would appreciate the persistent gusts of 50 to 65 mph that shook loose branches out of ancient oak trees to blow them across the fields like leaves in the fall. Miss Sadie and the Cowboy would have scampered after them but I stayed inside and felt the house brace each time “Maria” wailed. No traipsing today, just lots of hot beverages, tissues and memories of that wistful song. I do remember that song. Your Mariah wind is probably the very wind that is blowing its way north and east. When it gets to Ohio it’s going to start wheeling around, the better to come at Antrim County out of the east. I hate storms out of the east. Keep safe. Keep warm. Keep all good memories. Good heavens! I went out to the compost bins this morning and thought, “This is it – spring really has arrived.” We have crocuses already, snowdrops, and in some places daffodils and cherry blossom. It’s all too early, and anyway, we haven’t had winter yet! I don’t count the storms and rain as winter because they can come at any time of year. It’s weird. It is astonishing to visit about the blogosphere and find green grass, spring flowers, people denuded of their down coats. We are a long way from all that. We do not want an early spring, though. The poor fruit trees need to warm up gently – and then not freeze again. I tell you, farmers are at Mama Nature’s mercy. 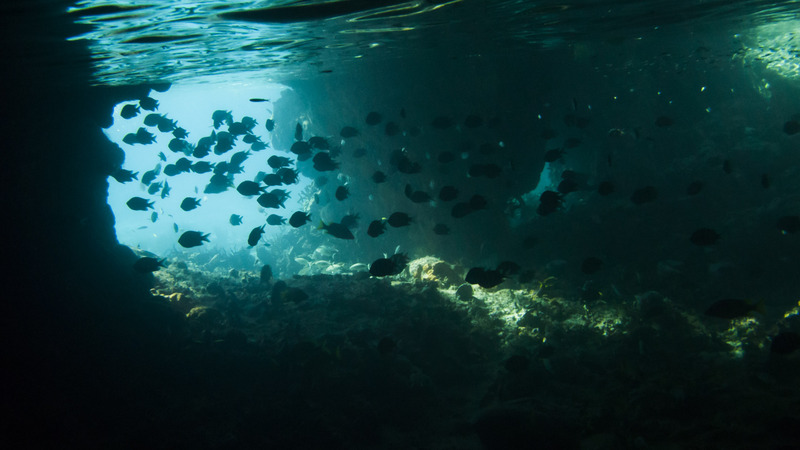 Amazing, really, the parallel between that last view and Thunderball Cave in the Bahamas. One difference, of course, is the temperature. Another is that the Thunderball cave is surrounded by swimming pigs, who wouldn’t be nearly so useful as Miss Sadie and the Cowboy when it comes to rescue. Years ago a friend invented the color Sky-Blue Pink. It fits these photos beautifully. And that first photo’s my favorite, by far. What are those little circular indentations next to the tracks? Do snowshoers use poles, too? I must wait a bit to see the Thunderball Cave but it is high on my list. Swimming pigs would be something to see. I think Sky-Blue Pink is a perfect description of dawn and dusk over the Bay. The circular indentations are indeed from poles. I use ancient ski poles from my downhill days; Weatherman Bruce and Andi his Beloved ski cross-country, and I suspect them of having something rather more current. Some people never use poles – I don’t use them if I’m walking dogs. No point in having yet another thing to get tangled up in the leashes. These photos seem eerie and beautiful at the same time. Although I consider myself up for an adventure most of the time, I think I would shy away from this one. I don’t think Teddy and Daphne could be trusted to run for help. Thank you Karma – I thought the photos were pretty special. Bruce took them with his iPhone, which gives me a grumpy case of technology envy. 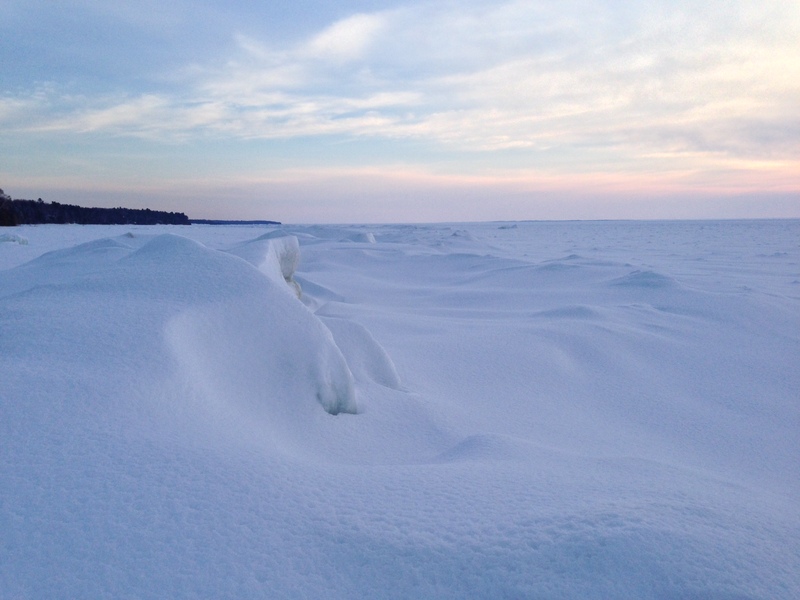 Gorgeous, gorgeous photographs, Gerry, but YES, not only is the lake now dangerous, but there is OPEN WATER in place of the ice caves, and Leelanau Emergency Services is asking people NOT TO GO OUT THERE! I am not the least bit surprised. Like so many other things, Great Lakes ice is lovely to look at and deceptively dangerous. Dangerously deceptive?